The MSA Shoe ™ has traveled to dozens of countries, rubbed shoulders with some notable people and visited many famous landmarks. The MSA Shoe is a tool for spreading MSA awareness, increasing support for MSA patients and their caregivers and fighting MSA by raising vital research dollars. The MSA Shoe's journey is undertaken in memory of all those that have died due to MSA and in support of all those presently fighting Multiple System Atrophy! This journey began as an innocent prank among a group of friends who wanted to make people laugh. One of those people was Pearl Turner, who had Multiple System Atrophy (MSA). How it all started was that a group of friends decided to steal one of the shoes of another friend named Tim, while he was sleeping. A Facebook page of photos was created to show the MSA Shoe as it traveled about the neighborhood, ending up in the strangest of places and in the company of different people. A few days into the prank, Pearl’s daughter Gretchen told her friends that when she showed the Facebook page to her mom, Pearl laughed for the first time in months. See, Gretchen’s mom Pearl was suffering greatly from the effects of Multiple System Atrophy. In the process, Gretchen’s friends learned more about MSA, that it was a rare, progressive and rapidly degenerating disease, similar to ALS (Lou Gehrig’s disease) but in many ways much worse and more rapid. They learned how little information was available on the disease, little research was being done anywhere in the world and how many people, even neurologists didn’t know much about the disease. After Pearl passed away, the circle of friends, together with Tim, decided that one way to honor Pearl was to use the MSA Shoe to raise more awareness of the condition – as a vehicle to provide information in the hopes that more awareness would help increase support for research into the cause and more treatments, and eventually to help bring about a cure for this terrible disease. Today, there are seven official MSA Shoes – representing each of the seven continents, with their own special character and cultural personality. Multiple System Atrophy is a rare rapidly progressing neurodegenerative disorder. MSA impairs the systems that regulate blood pressure, heart rate and bladder – many of the basic bodily functions that people take for granted every day. People with MSA suffer from dangerously low blood pressure, speech and swallowing difficulties, sleep disturbances, breathing problems, rigidity and tremors. The life expectancy for those with MSA is typically 5 – 10 years. Patients with advanced MSA often become bedridden, unable to speak and completely immobile. At present, there is no cure for MSA, no genetic tests to detect it and very few treatments to manage its debilitating effects. Sadly, Pearl Turner succumbed to this awful affliction. But her spirit lives on through the travels of the 7 official MSA Shoes, representing the 7 continents on their journeys to the far corners of the world – spreading awareness, far and wide, everywhere and with everyone! For more information about the MSA Shoe, and each of the 7 official MSA shoes, visit the official Facebook page at: https://www.facebook.com/MSAshoe. Note: The MSA Shoe Charity is an independent public charity and approved as a 501(c)(3) non-profit by the Internal Revenue Service in the United States. As of 2017, no other MSA related charity provides financial support. Therefore, we need your help to continue our global MSA awareness campaign. 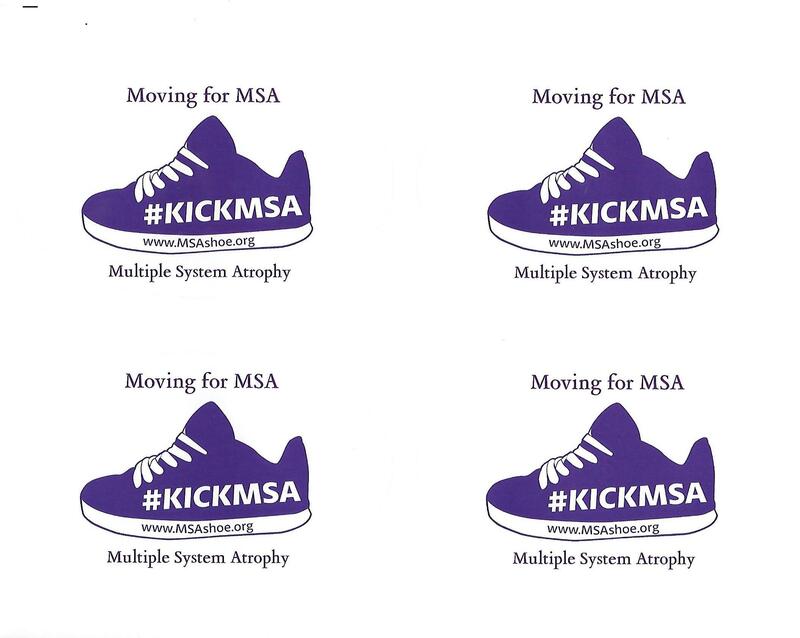 Please help keep the Shoe moving for MSA! Donate Now To Support Our Mission! * Indicates a representative of an associated charity or group.